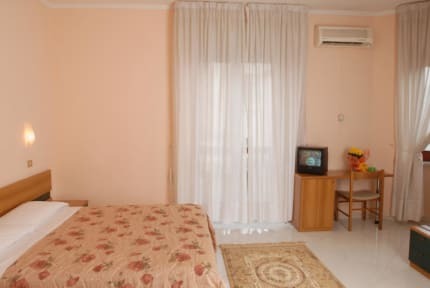 The hotel has 15 comfortable rooms, a bar-restaurant and a spacious and private parking. It is in addition to a central hotel that allows you to visit all the beauties of Pompeii, also a great place from which to explore all the pearls of Campania. Hotel Astoria is located in the historic center just a few minutes walk from the ruins and the Sanctuary of the Blessed Virgin of the Rosary. Check in from 10:00 to 23:00. Staff were very helpful and knowledgable of the local area. They gave us useful information on attractions, what to see and busses to get. There is a small supermarket round the corner and a cheap restaurant down the road. Included breakfast was good too. Would recommend if you’re going to see Pompeii and Vesuvius. 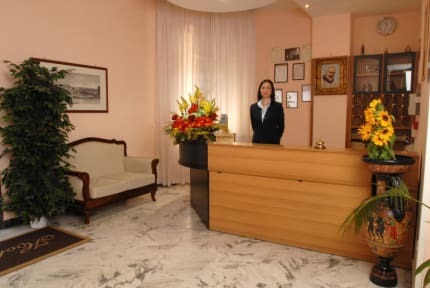 Small hotel with a family atmosphere, staff very friendly helping us a lot indicating places to eat and the way to go visit the archeological site of pompei. Lovely friendly little hotel convenient for the town of pompeii for evening meals and close to the ruins. Easy access to the autostrada for getting out and about. Staff are friendly and helpful but you may need your trusty Italian Phrasebook! Small and sympathetic hotel very near to Pompei station (not the main station of Pompei but all the regional trains stop there). Entrance to the ruins of Pompei is just a small walking distance away. Staff had a bit limited English skills but they were sweet and made us feel welcome. There was a grocery store right next to the place and plenty of restaurants neaby. Good value for the price, would stay again! Definitely not what I would consider to be a hostel, but nevertheless we had trouble finding accommodation in Pompeii and this seemed to have good reviews so we stayed for 3 nights. Initially we booked for 2 nights but extended to 3 after arriving and feeling comfortable (we heard bad things about Pompeii & Naples). Hosts do not speak very good English but were still extremely nice and helpful. Short distance to Pompeii town centre and ruins. Breakfast was lovely.